Happy Earth Day Sugar Fix fans! We had a GREAT week of better weather in Chicago! Everyone is out-and-about being active and getting their health on! So we at Sugar Fix wanted to share a few products with you to better yourself and this planet for Earth Day! Our favorite products to use are organic, all natural, and vegan friendly! Dr. Emery LOVES Hello toothpaste, Bogobrush, and Keeko Oil because they all have awesome eco-friendly ingredients that everyone will love. Hello toothpastes are made from Non-GMO crops and all natural ingredients. The toothpaste tube is BPA free while the toothpaste itself tastes amazing! Their flavors include peach mango mint, mojito mint, and supermint. The do have a kids line too with fun flavors like blue raspberry and bubblegum. YUMMY! If you are looking for a whitening or flouride-free toothpaste, fear not, Hello has a toothpaste just for you as well. Dr. Emery made a youtube video featuring their products that she uses all the time! Bogobrush is such a clever and eco-friendly toothbrush that we recommend highly for anyone looking to do their part for this planet! Not only is the toothbrush recyclable and biodegradable, but helpful to others. For every toothbrush sold, one is given away to someone in need. This is such a great company for sharing the importance of oral health to struggling families across the country in need. You should check out Dr. Emery’s youtube video so you can see what the hype is about! Keeko Oil is an amazing coconut oil pulling company out of Australia. Before this company, the way to oil pull was with using a thick coconut oil out of the jar and big spoon. Now, Keeko has individual packages per day that you run under hot water to liquefy and swish with for 5-10 minutes. What helps to get your teeth and overall health back in shape? The main ingredients are 100% natural and include coconut oil and the essential oils myrrh, chamomile and lemon. A huge upside to oil pulling with Keeko Oil is the amazing flavors! Morning mint, sweet sensation (our favorite one!) and citrus burst are all great tasting and the best part is they whiten your teeth as well! 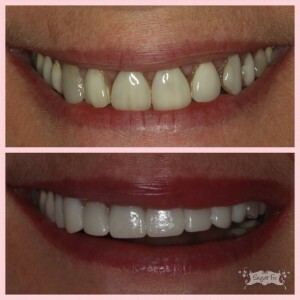 Check out the results on the Keeko Smiles page! Here at the office, we were busy with our veneer cases! 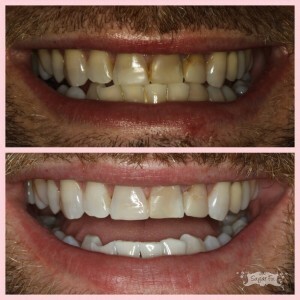 We had patients that did Zoom whitening in preparation for their veneer day. He was ready to find a permanent solution for the large composites on his front teeth. Zoom is step one to brighten the teeth that we are not replacing to an optimum white. The results are fantastic and he is really smiling about it! The second case of the week was a patient that had veneers and crowns that were on for over 20 years and knew it was time for a replacement. It was a 16 unit case, 8 teeth on top and 8 on the bottom. The patient is very happy with the results and is excited to get her finals in a few weeks! We were so happy for her to move forward and start to love her smile again.